Most small businesses will need a Tax ID/Employer ID Number (EIN). Although this form is used for identification of employers, it required for other legal purposes, and you will most likely be required to supply it for a bank account, loan application, or for accepting debit and credit cards. Here are the reasons why you might need an Employer iD Number - and when you don't. For the purpose of the instructions for the SS-4 form in this article, we'll assume that you need an EIN because you are starting a small business. We'll talk about the different options for filling out the form, depending upon your legal entity type and the other information you will need. When you have completed the form, you will be ready to use one of the 4 easy ways to apply, because all the information will be there for you to use. Be aware of fake Employer ID Number websites that look like the IRS site. They will let you complete the form then charge you to submit it. There is no fee to apply for an Employer ID Number from the IRS! First, a disclaimer: This "how to" is intended to provide a general discussion for new business owners. The form is complicated and this is a great oversimplification. It is not intended to provide legal or tax advice or give you specifics on how to complete this form. Each business situation is different and your tax professional may have specific directions for you. Please consult with your attorney or CPA to make sure you are in compliance with the tax laws and that you receive the best tax advantage for your specific situation. Begin by getting a copy of the SS-4 form that you can download and print out or fill in online. It's a good idea to work on a draft copy first before you actually apply, so you don't have to stop and think or check something. The IRS online application times out if you don't use it for a while. Item 1: Legal name of entity - This is the business name that every transaction and record will be linked to, so be sure it is absolutely correct. If you are a sole proprietor, enter your own name, not the business name. If you are a corporation, partnership, or LLC, enter the business name exactly as it appears on your business registration with your state. Item 2 "Trade Name of the business," use the "dba"/"fictitious name" you are operating the business as. For example, the Legal name might be Smith and Smith, LLC, but the operating name might be "Smith Accounting Services," the name on your signs and other items customers would see. Be sure you use the same name (either the legal name or the trade name) on all filings with the IRS, to avoid confusion. Item 3. Executor, administrator, trustee, "care of" name. Use the full first name, middle name, and last name of the person in charge of legal matters. It should be your “principal officer, general partner, grantor, owner, or trustor." This most often is the same as the person listed in 7a and the Registered Agent for an LLC or corporation. Include the social security number, ITIN, or EIN of this person or entity. Items 4a, 4b, 5a, 5b, and 6 are for your business mailing address, street address, and the county and state where your principal business is located. If your street address and mailing address are the same, leave 5a and 5b blank. Item 6 is for the physical location of your business. Item 7a. Responsible party. Read more about the difference between a "nominee" and a "responsible party" if you are not sure who to designate for this item. Items 8a, 8b, and 8c are important if you are setting up an LLC. If you answer "yes" to Item 8a, you must provide information in 8b-Number of members, and 8c-organized in the US (yes or no). If you are a single-member LLC you are considered by the IRS to be a "disregarded entity." If your business is a multiple-member LLC, you would typically be taxed as a partnership. If you want your multiple-member LLC to be taxed as a partnership, check "Partnership" under Item 9a. If you want your limited liability company to be taxed as a corporation, select the "corporation" option, since this is your tax type. If you aren't sure what type of entity to select or if you don't see your business type listed, don't just guess. Check with your tax professional. The IRS emphasizes that what you check in one of these boxes is not an official election of a tax type. Electing a way to be taxed must be done with a different form. Item 9b is for corporations. It asks you to name the state or country where you are incorporated. In Item 10, check the reason for applying. For example, check "Started a new business" and provide a very brief description of your business. You don't need to go into a lot of detail; a few words will do. For Item 11, Date Business Started you can choose any reasonable date, such as the date you actually opened your doors and began serving customers. If the business already exists, enter the date you first owned it or the date you owned it as the business type above. The start date is important if you are starting around the end of your fiscal year. Check with your accountant or tax attorney about the tax implications of startup dates. For Item 12, Closing month of accounting year select your fiscal (financial) year by designating the closing month. For businesses operating as a sole proprietorship, this would be December 31. There may be other reasons for choosing a different date. Before you select a date, check with your CPA for tax implications of this date. Item 13 asks you to select the "highest number" of employees expected in the first 12 months. Unless you are running a farm or are hiring household help, you would put the number under "Other." For Item 14, consider whether you will have less than $1000 in employment tax liability (for Social Security/Medicare, withholding, and unemployment). If you will have no employees, or you will be paying less than $4000 in wages to all employees within the year, mark "no." This article on Form 944 might give you some more information. If you aren't sure, talk to your tax advisor. For Item 15, if you will have employees, enter the estimated date of your first payroll. For Item 16, enter the business classification that best fits your type of business, or enter "Other" and specify. The Form SS-4 instructions have detailed definitions of these categories. For Item 17, provide more information on the type/s of products or services you will be selling or providing. For example, if you checked "health care," add "dental office;" If you checked "retail" add "coffee shop." For Item 18, indicate if the business (under the legal name in Item 1) has ever applied for or received an EIN previously. Note that you may include the name and address of a "third party designee" to receive your EIN and represent you. You may want your attorney to perform this function. Determine how you will apply: online, by phone, by mail, or by FAX. Read "How to Apply for an EIN" for more information on the process involved with each of these application processes. What legal business entity you will be forming (corporation, partnership, sole proprietorship, LLC). You will also need to know if your LLC is one-member or multiple-member. Information about your responsible party. An estimate of how many employees you will have and how much you will be paying them each year. 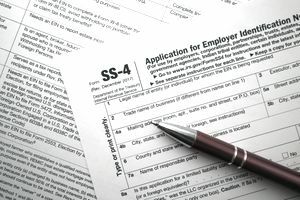 For more detailed instructions on filling out Form SS-4, or if you have questions, go to the SS-4 instructions on the IRS website.